As the parents of students at Wayzata School, we write to express our serious concern over the recent proposal of Option B (Research-Aligned Scenario), which is considered as the one that is in the best interest of the greatest number of students in our school district and the one that could be implemented starting of school year 2016-2017. We applaud that the school district is considering changing the school start time to give the high school students more sleep time and we also appreciate your hard work. However, the whole memo and the research cited/provided in the memo emphasized on how later start times would benefit the teenagers only. We feel disappointed and concerned that the sleeping patterns and the correlation between sleep and learning, big financial burdens, safety issues and quality time in working families for young students, especially for the elementary students, were not as much considered in the research-aligned scenario. Our concerns are particularly for a number of reasons, including the following. First, it seems that the Option B (Research-Aligned Scenario) focuses on the benefits of shifting start times for only high school students, ignoring younger students, especially elementary school students. We agree that high school students can benefit from later start times. However, later start times for high school students should not be achieved by compromising younger children’s sleeping pattern and sleeping cycle. In the Research Aligned Scenario, elementary school students either need to be dropped off at school at 7:20 or be picked up by a bus as early as 6:45am, which means that these younger children (aged 5 through 11) need to get up at 6:00am or even earlier to get prepared for school. This contradicts with younger children’s sleeping patterns. A research conducted by National Sleep Foundation shows that on average, school-aged children (aged 5 through 10) tend to wake between 7:00 and 7:30 a.m. Younger students with less sleep overall or a poorer quality of sleep struggle with learning at school and performance on tests. The National Sleep Foundation recommends 10 to 11 hours of sleep for school-aged children (ages 5-10). Adequate sleep is essential for elementary school students’ learning. There have been studies showing the associations between early school start time and poorer school performance. Research shows that even a 30 minute increase in sleep for pre-adolescent students results in “significant improvement in their ability to regulate their emotions, including limiting restless-impulsive behavior in school.” Such an increase is also noted to promote “a significant reduction in reported daytime sleepiness.” As parents of these young kids, we do not want to see the shift change listed in this Research-Aligned Scenario would impact on the physical, emotional health and school performance of thousands of young students in elementary schools. Second, Option B (Research-Aligned Scenario) contradicts the standard practice in other school districts in Minnesota. Figure 1 below shows the range of elementary school start time in the current proposed 3 options vs standard practice in our peer school districts. It clearly shows that the current start time of 7:45am for Greenwood and Oakwood elementary schools is much lower than the average school time of 9:02am in 77 MN elementary schools. The proposed start time for elementary schools in Research Aligned Scenario is even further away from the current standard practice. The impact includes, but is not limited to, that we would have more kids with sleeping and emotional issues in our Wayzata school district than our peers in other school districts and we will encounter school performance issues from younger kids due to lack of sleep and early start at school. Third, early start of elementary schools at 7:30am proposed in Option B (Research-Aligned Scenario) would significantly increase financial burdens for working families. Under current starting schedule, families have multiple ways to arrange for after school child care. Elementary students can be cared of by their older middle/high school siblings because elementary students are released after middle or high schools. Other families can adjust working time to allow returning home by 4:00pm for the elementary school bus. However, if elementary schools start at 7:30am and release at 2:10pm as proposed under Option B (Research-Aligned Scenario), majority of working families will have to use after school child care. After school child care ranges from $18.5/day (home base) to over $10/hour from other sources. This will add an average $500/month expense or over $4000/year per kid for working families. The cost will be multiplied if family has more than one child attending elementary school. This extra expense create significant financial burden for working families, and will eventually affect child education and other living quality because families will have to cut expense on other aspects to make ends meet. Fourth, the proposed early start of elementary schools in Option B (Research-Aligned Scenario) would bring safety issues for younger children. In Minnesota, Sunrise is between 7:30 and 8:00am in winter and it is extremely cold outside in the early morning. Under the Research-Aligned Scenario, elementary students either need to be dropped off at school at 7:20 or be picked up by a bus as early as 6:45am. It is still dark outside then. For young children between 5 and 11, it is even more dangerous because of their height or eyesight at younger age. The darkness and coldness would bring a lot of safety issues or threats to our kids. Lastly, the proposed early start of elementary schools in Option B (Research-Aligned Scenario) especially would reduce the quality time for working families. With the proposed start time of 7:30am for elementary schools in Research-Aligned Scenario, to ensure 10-11 hours of sleep as recommended by National Sleep Foundation for school-aged children (ages 5-10), younger children would have to go to bed between 7:00 and 8:00pm. It is not feasible to arrange any after school activities such as formal sports training if both parents work during the day. Many of inter-district sports practices and academic enrichments will not end until 7-8 pm. Proposed early start of elementary schools will largely limit the participation of after school activities for our students. This becomes even harder if both parents work during the day.  Many of high school athlete developed interests in sports at young age. The importance of participating after-school activities cannot be under-estimated. In addition, it is almost not feasible to put kids into bed as early as 7:00pm if parents would like to spend some quality time with them, such as asking about school life or helping them with homework after a working day. One direct result out of this is that our younger kids’ performance will get worse due to the change of school start time under the Research-Aligned Scenario. We understand the proposed option B of Research-Aligned Scenario comes from the research advocating for later school start times for teens, or adolescents. However, as parents for younger children in elementary schools, we sincerely request the School Board to take into account of the impacts and risks of this change on the younger kids and do more research on the impact of shifting start time on elementary school students. If the kids do not have a solid foundation in health and academics when they are in elementary school, we would face more challenges in the future when they grow up. What we want to avoid is that we only solve the school start time for high school students for now, while at the price of less sleep, poor school performance, big financial burdens, more heath and emotion issues, and safety risks in elementary school children; and we have to re-discuss the school start time again in another three years after we see all these negative impacts as we can foresee now. Hopefully this can be helpful when the School Board reviews all these scenarios and make decisions. If a survey is made we will have similar responses. And actually we propose that we can make similar surveys to get parents’ thoughts. We firmly believe that the School Board had considered other options to resolve the school start issue, but as a group of parents who value our connection with our school district and support the development of our education environment that our kids grow in, we propose other options that we either saw the success in other school district or propose based on our current understanding of the situation we are facing. Based on the data on FY 2014 Pupil Transportation data as shown in Figure 2, we can see that as compared to our neighbor school districts, we have similar cost per student. 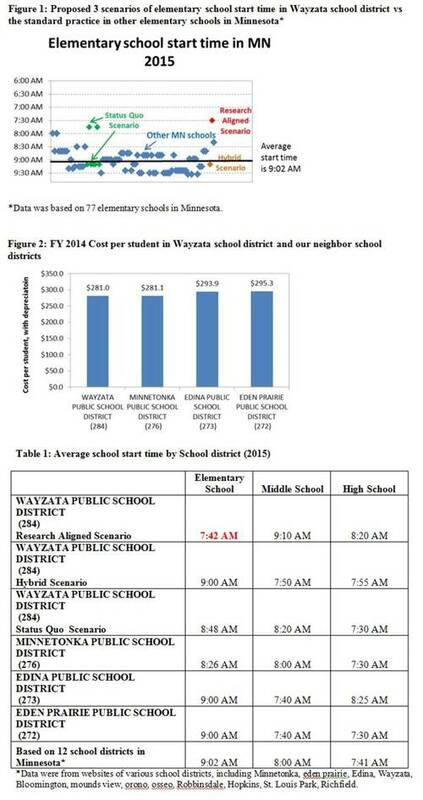 We believe that the school start issue that Wayzata is facing is similar to these neighbor school districts and we are under the similar budget as other school districts since the cost is so similar. May we borrow some experience from other school districts and consider the approaches that have taken effective in other school districts? To give a perspective of how the proposed school start time compares against our neighbor school districts and the overall 12 school districts in Minnesota. We collected the data from 77 elementary schools, 25 middle schools and 17 high schools. The average school start times are 9.02 AM, 8:00 AM and 7:41 AM for elementary schools, middle schools and high schools respectively. To compare our proposed school start time under Research Aligned Scenario, the start of elementary school is way too early, as shown in Table 1. We sincerely hope our research work from the school districts around us can help make final decision on the school start time. We hope to see a late start for both younger children and older children in our school district for the benefit of their health and academic performance. We are wondering whether school district can increase the number of school buses so that high school students can also start at a later time. The budget of doing so may come from cutting other spending such as iPads for young kids. Or we can even ask parents whether we can pay for some fees if more buses are used. Other options might be doable as well. There had been a successful example in Minneapolis and St. Paul school districts by partnering with Metro Transit. For the past three years, Metro Transit has bused about 5,000 Minneapolis students to and from that city's high schools. If increasing buses or leveraging other transportation is not an option, we urge to do further research on the impact of early start on elementary students (pre-adolescent) which current Memo fails to address. And we would like to know what efforts the school district will take to solve the problems that we raised above. We won’t be able to support any change in the school start time with only one-sided research that has done so far. We hope that you will consider the concerns raised above and carefully make your decision to change the school start time for the academic performance and well-being of all kids in our school district including the younger students in our community.